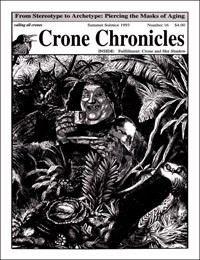 Crone Chronicles #16(original) Crone and Her Shadow [cc16] - $5.95 : BBI Media - Magazines that feed your soul. This classic early edition reveals the nascent Crone consciousness rising to the surface. Brief, but potent articles on fighting the "youth culture," ("Ageism in America"), the utter lack of role models for womanhood past menopause ("Escaping the Image Trap"), crone pride ("You Don't Look That Old! "), and the pre-history of Goddess culture ("Who is the Crone?") fill this issue. There's a variety of more in-depth pieces as well, including Ann Kreilkamp's riveting interview with yoga teacher Serena Early on the transformational journey she took driving (as she tells it) from Heaven to Hell in "Awake in Waco." There's also a report announcing the (first ever!) Crones Counsel, controversial questions ("Is the crone lesbian?" and "is death just a belief system?") as well as Ellen Carr's emotionally riveting story of the aftermath of her experience with choosing an alternative healing path with a breast lump. This is a powerful issue full of surprises. 40 pages, published in Summer of 1993.